Just a couple weeks back Adobe released a patch to fix one of its several vulnerabilities. 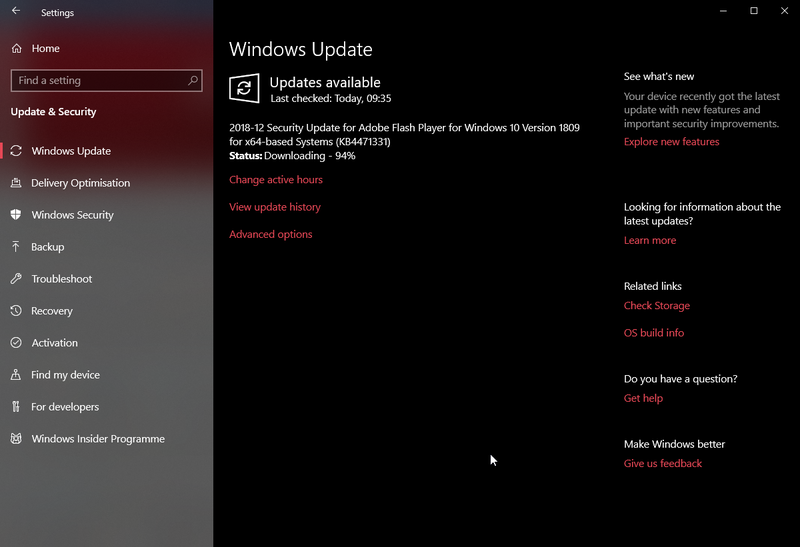 Microsoft promptly released the patch as KB4477029 to all supported Windows systems so that you don't have to worry about all the security holes in Adobe Flash Player. As usual, Adobe found another Zero-day vulnerability (CVE-2018-15982) that let attackers trigger and execute an arbitrary code and take control of your machine. This vulnerability affects almost every system and software that makes use of or has Adobe Flash Player installed. So, it is strongly suggested that you update your machine as soon as possible. Keep in mind that this is just a security update and no feature updates are included. If you've not paused Windows 10 updates, you can be sure that Windows 10 will automatically download and install KB4471331 as soon as possible. If you want to, you can manually trigger the update by going to "Settings -> Update and Security -> Windows update" and clicking on the "Check for updates" button. As soon as you click on the button, Windows 10 will check and download all the available updates. In case of any errors or If you cannot download the KB4471331 update using the settings app, you can download it using the below direct download link. Here is the direct download link to download KB4471331 update. This link contains download links for both x86 (32-bit) and x64 (64-bit) systems. Depending on your system architecture, download the one you need. You can install KB4471331 like any other software. Don't forget to restart Windows to apply the update. If you are interested, you can find more details about the vulnerability from the official Adobe Security Bulletin and Microsoft security advisory.